The dietary laws of the Old Testament carefully prescribed what creatures could be eaten by the Israelite nation. Leviticus 11:13-19 gives a list of various birds and ends with bats. Bats are not classified as “fowl” in the modern delineation but were for the Hebrews. (Incidentally, the term “fowl” or “bird” in Leviticus 11:13 and Genesis 1:20-30 is the Hebrew word ‘ôp, which literally means “flying creatures.” It is derived from ‘ûp, which denotes “to fly, fly about, fly away.”) Then we have a special command in verse 20: “All fowls that creep, going upon all four, shall be an abomination unto you.” What are these unclean fowl that go on all fours? It wouldn’t be bats, which were just discussed in the prior verse. Some commentators again point out that the Hebrew word here simply means “flying things” and they suggest that this verse references insects. Perhaps this is correct, but the six-legged insects are dealt with in their own section in verses 21-23. Could the fowl on all fours be penguins? Penguins use their wings to fly through the water and to get up on land, but then they typically walk on just two feet. Moreover, it is unlikely the Israelites would have encountered them! Joe Taylor suggests another group of animals that fit the bill nicely: pterosaurs (Taylor, Joe, Giants Against Evolution, 2012, p. 113.). 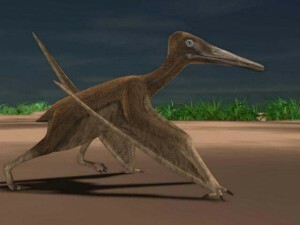 Today’s scientists classify the pterosaurs among the reptiles rather than the birds. But the Pterodactyloid pterosaurs, with their headcrests and short tails, would likely have been lumped in with the fowl by the ancient Hebrews. (It seems that a species of long-tailed Rhamphorhynchoid pterosaur was known as the fiery flying serpent to the Hebrews.) We know from fossil trackways that many of these Pterodactyloid pterosaurs scurried around on all fours. Perhaps there were living pterodactyloid pterosaurs still thriving in the region of the Middle East during the times of the Exodus. Like the bat and various unclean birds, they were not to be eaten.